I want to say "thank you." I know the chances of you reading this post are very small—perhaps infinitesimal—but on the slight chance you see a link to this post, I want to tell you a bit about the girl you're supporting and the many kids like her. Anna is an amazing girl. I know I'm biased since I'm her dad, but she really is. She is six-and-a-half and she just started first grade: she loves to read, to swim, and to perform for anyone who'll watch, or when she's alone in front of a mirror. She wants to be an actress and I think she'll be a good one: we're looking into classes for next spring. But to act she has to be understood and that's a challenge for her. At two-and-a-half years old she was diagnosed with Childhood Apraxia of Speech. CAS is a motor-speech disorder where her brain knows what to say but the mouth can't keep up. It's a spectrum disorder: some kids don't talk at all while others talk non-stop but can't be understood. Anna was in the latter category: she still is, but thanks to almost four years of intensive speech therapy, we now understand her most of the time. She's not done yet, but she's come a long way. Speech therapy has made a huge difference in her life and we are grateful to all the speech language pathologists (SLPs) she has worked with over the last few years. 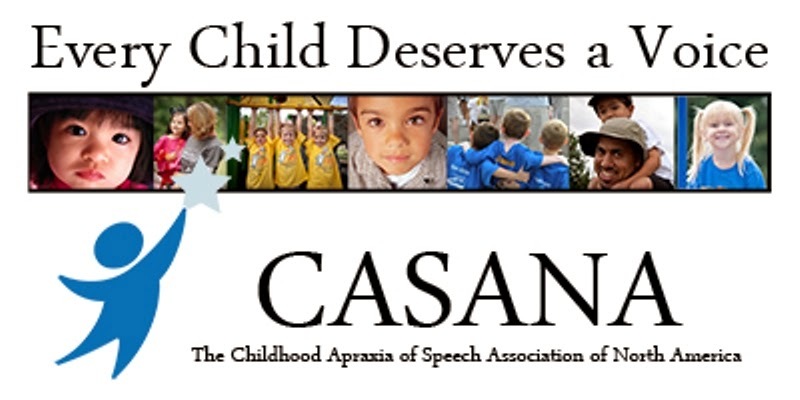 SLPs undergo intensive training in order to work with children with CAS, and CASANA helps fund some of that training. They also fund research, iPad app development, and outreach to over 350,000 people each year through Apraxa-KIDS.com, the Apraxia-KIDS blog, and social media sites like Facebook and Twitter. None of this would be possible without donations like yours. 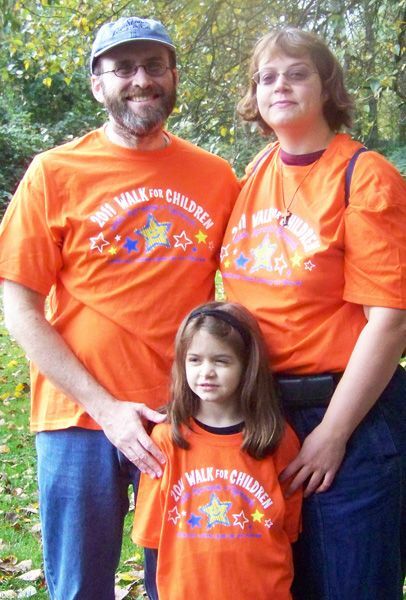 Every year, kids with Apraxia and their families participate in walks across the country to raise money and awareness. Last year, we walked with a small group of families in Salem, Oregon, and despite registering just before the deadline we still raised $360. This year, with more time to plan, we hoped to do better. We did. My wife's employer gave us $1000 (meeting our original goal) in early-September. Friends and family contributed too. And Anna decided to do her part. She saved change from household chores in a special Apraxia piggybank, set up a lemonade stand during a church garage sale, and contributed half of the money she made selling her pre-school aged toys in the same sale. She raised $50 all by herself, which we matched to bring her total contribution to $100. After the sale was over, we submitted her contributions to our fundraising page, leaving us only $60 short of out new goal of $1350. I posted the story of her lemonade stand on both Facebook and Twitter and with less than two weeks to go we hit our goal. Thanks to you, anonymous donor. It's been said by many people that the greatest testimony to a person's character is what he or she does when no one is looking. This contribution, however big or small it may seem to you, is a great testament to your character. You didn't give it in hope of recognition. You knew that no one would ever know your identity and yet you gave anyway. We will never know your name, but we will always be grateful. David, Julia, and Anna Ozab. Biography: David Ozab is currently editing and revising his first non-fiction book, A Smile for Anna, which tells the story of his daughter’s cleft diagnosis and surgery, her difficulties with speech, and her incredible outgoing spirit through it all. He is a Contributing Editor at About This Particular Macintosh and a Guest Contributor at MyEugene. His writing has been (or will be) featured such diverse publications as Chicken Soup for the Soul, Errant Parent, and Catholic Digest. He is a stay-at-home dad and blogs about parenting and life at Fatherhood Etc (http://www.fatherhoodetc.com). He lives in Oregon with his wife Julia, his daughter Anna, and two lop rabbits named Jellybean and Oreo. Yes absolutely right ...every child deserve a voice..